There's a new crown jewel in Beefeater's lineup. The story of Beefeater Gin starts back in 1862 when James Burrough bought out the Chelsea Distillery for the tidy sum of £400. Within two years he had expanded the product line to include several Liqueurs and Gins — including his flagship premium “Beefeater” Gin, which became by far his best selling product. 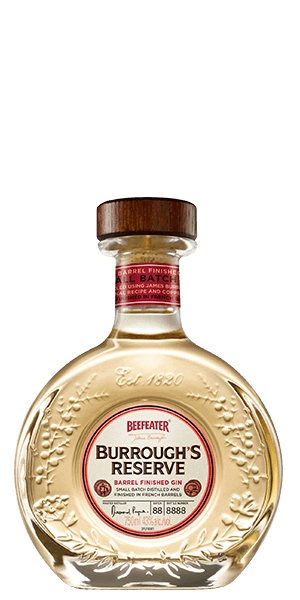 The huge liquor conglomerate Pernod Ricard owns the company now, but the recipe and technique devised by Burroughs is still in use and Beefeater produces nearly 28 million bottles of Gin per year, available in more than one hundred countries. Beefeater Burrough's Reserve is a very special Gin indeed — aged unlike any other Gin. They start with the classic Beefeater Gin made to the exacting standards and recipe invented by James Burroughs all those years ago. But this Reserve Gin is made only in the small batch “still no. 12.” Then it is rested in French oak casks that were used for both red and white Bordeaux Wine. The result is a fresher, thicker Gin with a light copper hue. The “Beefeaters” were the “Yeomen Wanders” — ceremonial guardians in the Tower of London responsible for minding the crown jewels and any prisoners there at the time. It’s believed that they got the nickname from the Grand Duke of Tuscany who noted that this elite guard enjoyed the job perk of a larger portion of beef for their meals. What does Beefeater Burrough's Reserve Gin taste like? The Flavor Spiral™ shows the most common flavors that you'll taste in Beefeater Burrough's Reserve Gin and gives you a chance to have a taste of it before actually tasting it. My current favorite winter gin! Great balance of spice and botanicals, a real departure from Beefeater's usual offerings. Unique and worth trying! Great sipping gin. I prefer it served neat and well chilled.